CIOReview designed this annual listing to acknowledge companies that are at the forefront of providing solutions around VMware platform and impacting the marketplace. A distinguished panel comprising of CEOs, CIOs and analysts including CIOReview’s editorial board has analyzed hundreds of VMware solution providers over the last few months based on their capability to offer cutting edge technologies and solutions that add value to the burgeoning VMware arena. 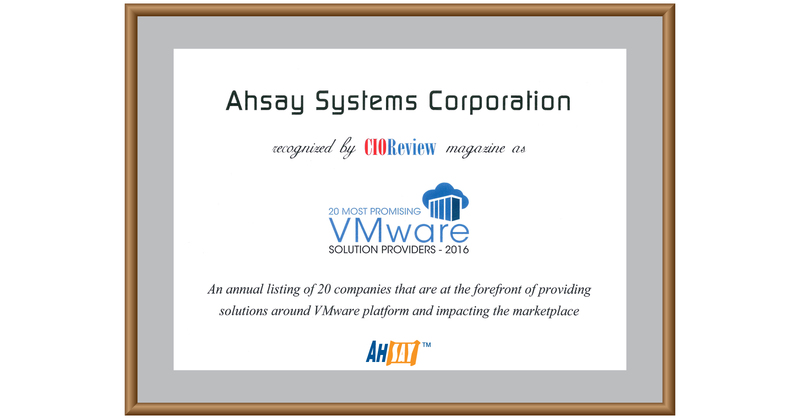 Ahsay is honored to be selected in the final list of VMware Solution Providers 2016. This recognition gives us a huge boost to keep improving our products to deliver value-added backup solutions to the business community.